Hi Dave – Great blog. Thank you for championing the cause of CA’s heritage trout. In my mind, this is a noble endeavor. I have already written my support of the 2009 treatment of SKC below Llewellyn Falls to Stafford Lehr, and am hopeful this year’s effort is allowed to proceed and succeed. I was one of the fortunate 8 who fished SKC above the falls in Upper Trout Meadow last August, as part of the DFG study. My short story of that adventure will appear in the upcoming July or August issue of Sierra Heritage Magazine. 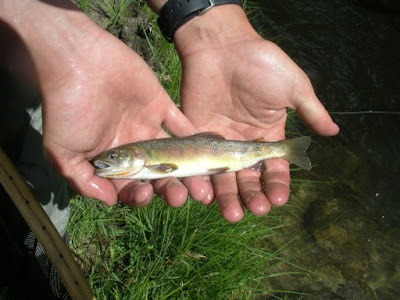 I am very interested in your activities as Threatened Trout Coordinator for DFG, and I ask you to keep me posted. Is there a way I can automatically receive your posts to my email? Steve Berg: steve@wassermanins.com. Best wishes and thanks again for your efforts. Shoot me an email if you could, I have a question about the "other" locations. Thanks! Steve - I am not the Threatened Trout Coordinator. Dave Lentz (whom I was fishing with) is. You can reach him at the DFG. I agree totally with you as far as heritage trout are concerned. I have recently (2 years now) started filling out the DFG passport program and heritage trout program and even though I have always been intrigued and bewildered by trout, I now realize how truly amazing creatures they are! I mean, not only are there different types of trout, but there are different variations and morphologies of the same species! I have had the pleasure of fishing in a lot of different places throughout california in the last ten years, and have a few favorites that I could probably write a book about. The way they can physically change to blend in and compliment their environment is crazy. Totally insane. Really, there are no words to describe it that can honestly explain it to people until they experience it themselves. Some of my friends have criticized me about the size of some of the stream trout that I have pictures of in some of my backpacking photos and then I take them out to catch them and they flip! They become the ones who get that buzz going and can't shut up about the vivid coloration or how hard they fought for such a small guy! haha. Gotta love it. These fish need to be protected and cherished like any other resource, like gold!! Or else, our children may lose them in translation and never get that chance to "see for themselves". If that happens then, well, I guess that's one less miracle of the earth for everyone. There will always be something special shared between you and that fish as you release the hook and watch him swim away. As you look around at its world you think to yourself how lucky you are to be there in that moment of time as we all spin through space. So, ya I agree. Let's do something now to save it for later!!!! ps. sorry for rambling, i could talk for hours about fishing.